This title was first published in 2001. Nineteenth-century employers played a crucial role in the training and education of young workers in England. 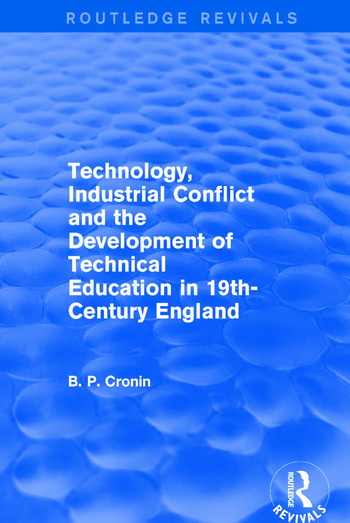 This multi-disciplinary study traces the connection between problems of technical education development and the increasingly antagonistic relations with skilled workers, culminating in the Great Strike and Lockout of 1897. Cronin demonstrates that employers, dominated by economic short-termism, extended their hegemony beyond the boundaries of the factory gates. Their reluctance to endorse and sponsor technical education radically influenced the perception of technical education held by government and local authorities. Contents: Preface; Introduction; 19th-century machine tools: the work of Maudslay, Nasmyth and Whitworth; The interaction of work and technology: the influence of F. W. Taylor and H. Braverman; Technology, changing definitions of skill and the use of child labour; Skill and the collapse of the craft apprentice system; Employers and the ideology of engineering management: the Great Strike of 1897-98 and its aftermath; Contradictions and struggle in ideas about a national system of technical education; Employers, the foundation of the City and Guilds of London Institute and government legislation; Industrial conflict and 19th-century technical and educational change; References and bibiography; Index.